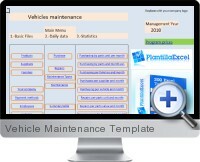 The Vehicle Maintenance Template for Excel is designed to track and monitor costs, required repairs and maintenance of a fleet of up to 50 vehicles. Vehicles can be registered with details relating to employees, maintenance obligations, parts storage, service suppliers and more. Obtain knowledge of what is spent on vehicles and when to perform maintenance tasks on each vehicle. Control of the parts purchased for vehicles each month and what is spent each month on repairs. Calculation of monthly car expenditure broken down by supplier. Know when to make the maintenance of vehicles, renewal of ITV cards, transport permissions, insurance, tire changes, oil and more. Find out how many parts are on hand and how many are required to be ordered. Calculate the value of vehicle spare parts in stock. See at a glance the state of all vehicles, the state of maintenance, graphs of monthly expenses with breakdown of articles, all on a single summary sheet. Automatic calculation of quantity to order for each product part depending on the minimum stock specified for each product. Reporting statistics for purchases and repairs, month by month, by product, supplier and product family. Compatible with Excel 2003 and higher.